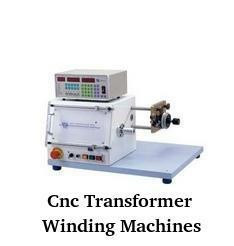 Our in depth experience of manufacturing, supplying, and exporting large spectrum of Transformer Winding Machines has empowered us to present Cnc Transformer Winding Machines to our clients. These are used extensively in transformer manufacturing industries as well as electrical and electronic industries. These are manufactured by using state of the art technologies in modern manufacturing facilities. We manufacture these by using the best grads of components and offer our customers at leading industry rates.